We are nearing the grand finale of our long and disheartening election opera, one we dare not ignore because the outcomes matter so much. While the election results will not be determined by public reactions to the Affordable Care Act, the ACA’s fate will be mightily determined by Tuesday’s outcomes. What have we learned about our collective health future over the past 18 months and what might this mean for our health system’s future? 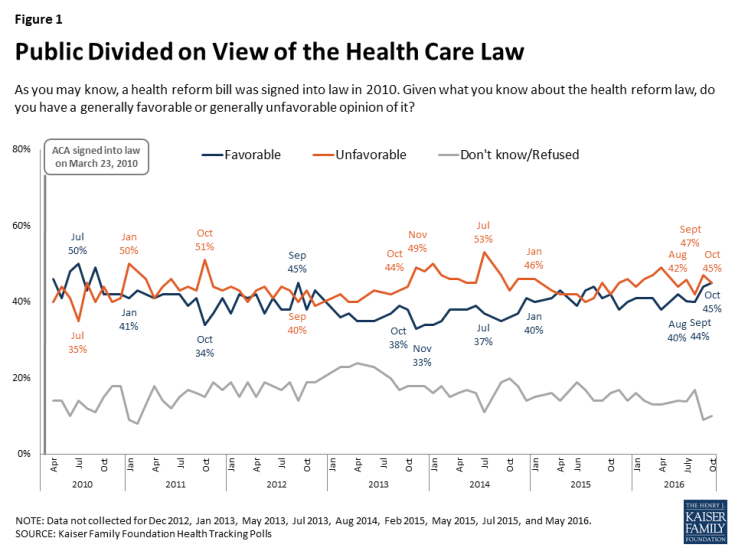 Kaiser monthly tracking polls show reliably unfavorable attitudes toward the ACA, slightly beating favorables, and stuck since 2014 in 40 percent purgatory. The advantages millions of Americans feel from ACA insurance coverage expansions and other access reforms are balanced by those who now blame the ACA for everything bad that happens in health care. The misnamed Pottery Barn rule—“if you break it, you own it”—applies here even though the dish was broken well before the ACA. Beyond this, if there is one thing on which both sides of the new Republican divide concur, it is a deep hostility towards ObamaCare. The election cycle seems to have only hardened these views. We know more about the preferences of both parties with respect to the ACA than we did 18 months ago. Hillary Clinton, Donald Trump, and House Speaker Paul Ryan, have released health reform planks that clarify their intentions — regardless of Congressional feasibility. Clinton wants to maintain and strengthen the ACA by improving premium affordability and by addressing excessive cost sharing in the Exchanges and beyond. She has an eight-point plan to address pharmaceutical prices. She will emphasize women’s health, and much more. Her campaign has articulated the first full agenda of any leading Democrat to improve and advance the ACA, helping to define the arena of possibility, whether far-fetched or not. After early teasing about his admiration for the Canadian and Scottish single-payer systems, Trump embraced standard Republican orthodoxy on ObamaCare, most recently announcing his intention to call a special Congressional session as soon as possible to repeal the law. Two independent research institutes (Committee for a Responsible Federal Budget and the Commonwealth Fund) have concluded that Trump’s agenda, if implemented, would result in 20 million Americans losing health insurance and would increase the federal deficit by $330-550 billion over 10 years. Meanwhile, Speaker Ryan announced in September his intention—if Republicans control both houses of Congress and the White House in January—to expedite budget reconciliation legislation that would repeal as much of ObamaCare as possible. Though Ryan’s plan is more ambitious than Trump’s, of the latter’s seven health policy planks, five also show up on the Speaker’s agenda. The final week’s fireworks over premium increases in the individual health insurance market only emphasize that the political volatility of the ACA/ObamaCare has not diminished at all. Source: POLITICO, Harvard T.H. Chan School of Public Health Poll. 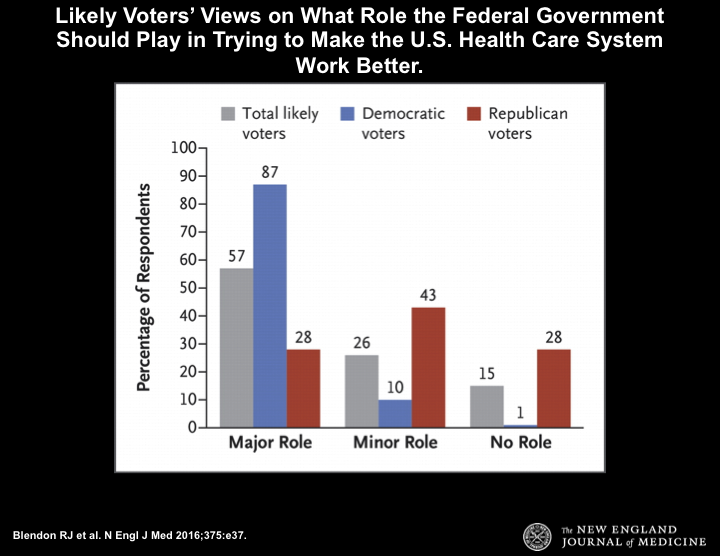 Voters and health care in the 2016 election. September 14–21, 2016. The notion that these differences might be leavened, for example, by changing the age-rating bands (the maximum amount an insurer can charge in premiums for young people versus older enrollees) in the Exchanges from three-to-one up to six-to-one, is delusional. Six and a half years after its signing, the ACA has yet to become settled policy because the differences are simply too deep and neither side of the political divide can risk the backlash of surrender. The excessively high premium increases in 2017 in the ACA Exchanges, more than anything, are tied to elimination in 2017 of risk corridors and reinsurance, as well as the undermining of risk adjustment. This past summer, Alaska’s Republican Legislature established its own reinsurance mechanism to stabilize rates, and immediately saw premium increases drop from over 40 percent to under 10 percent. In my time as a member of the Massachusetts House of Representatives (1985-1997), I learned that when political partners like and respect each other, the most difficult challenges could be met with seeming ease; and conversely, when parties disliked and disrespected each other, the easiest chores were impossible to achieve. And thus it is with the ACA Exchanges, eminently fixable technically, and utterly unfixable politically. And ACA demolition is advanced with no clearly defined replacement alternative. Yes, Speaker Ryan advanced a health reform agenda this past summer; yet he and his team did not put their ideas into legislative language that could be scored by the Congressional Budget Office, perhaps because they knew that the results on both lost insurance coverage and rising costs would turn the public against them. “The future, like everything else, is no longer quite what it used to be.” (Paul Valery, 1937, not Yogi Berra). As I write this on November 3rd, the most likely outcome from November 8 is divided government, with a Senate majority hanging by a thread. (Please recall that Senator Al Franken (D-MN) took his U.S. Senate seat for the first time in July 2009 after an eight-month recount process.) Republicans know that the electoral map in 2018, all things being equal, will offer substantial gains in both the Senate and the House, particularly if their political base is pleased. Democrats know that they will need to deliver on at least some of their promises, and not allow the signal accomplishment of the Obama Administration to fall apart. Dare I say it: we’re going to need some statesmanship at a time when that commodity is in short supply.